Blast Away with the Updated, Waterproof Bullet! Introducing the refreshed HPI Bullet MT 3.0, the ready-built off-road vehicle that's ideal for all off-road bashers and enthusiasts! Now featuring a waterproof battery compartment, waterproof servos and rain cover for the air filter, the Bullet 3.0 is now truly a go-anywhere machine! This Bullet is 1/10th scale monster truck fitted with a powerful 4WD drive-train and extra-powerful HPI Nitro Star G3.0 engine with 2.2 horsepower, so it can power through all sorts of terrain and fly over any obstacles! 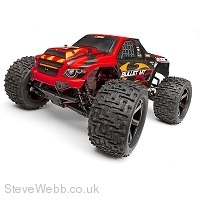 Now fitted with a versatile and comfortable HPI 2.4GHz radio system, it's easier than ever to control the speed of the Bullet! The Bullet MT 3.0 is just one member of a family of HPI vehicles which are based around a durable 4WD shaft drive-train, 2 shocks per wheel and double-deck aluminium chassis. The Bullet off-road trucks feature either Nitro Star 3.0 engines or silent Flux brushless motor systems, and are available in different off-road truck varieties. In short, you can get the precise flavour of off-road performance you want with the HPI Bullet! The Bullet 3.0 trucks now feature a cool waterproof electronics compartment for the receiver batteries and receiver, a sealed waterproof switch, a pair of 4.5kg waterproof servos and finally a water-resistant air filter cover that allows you to keep running your Bullet in extreme conditions that would kill almost any other Nitro vehicle! Want to tackle that muddy bog? How about that stream crossing? A bit of rain about to fall? It's all good for the Bullet 3.0! You won't have to worry about radio crystals or what channel other RC racers are using with our 2.4GHz technology - the radio does all that work for you! The radio prevents frequency conflicts automatically and changes channels if there is any interference. Finally, if you ever lose radio signal or battery power, an electronic fail-safe will bring it to a safe and controlled stop. You'll have professional-level control in one easy RTR package! The Nitro Star G3.0 engine provides all the muscle for the Bullet 3.0 nitro trucks - it's loud, powerful and strong, to give you amazing acceleration and awesome top speed! The engine is started by a simple pull-starter system and is protected by a unique water splash cover and 2-stage air filter for extra protection, and the two-needle carburettor allows you to fine-tune the performance of the engine for any kind of weather or fuel. The drive-train used in all Bullet trucks is a full-time four-wheel drive shaft-type, just like the one used in 1/8th scale buggies like the World Champion D8 buggy. A shaft drive-train is the best option for a kit that's expected to encounter every possible driving condition and track surface, so whether you're blasting through mud, water, dirt, grass, snow or gravel, this is exactly what you what you want! A strong plastic 54-tooth spur gear takes the power from the engine and transmits it front and rear through an adjustable dual pad slipper clutch. A dual pad slipper provides more protection to the drive-train than a standard single pad design, and we've included it as standard to make sure you get the best out of the Bullet. The centre dogbones drive the front and rear bevel differentials, which use 4 internal gears for increased durability and lifetime over standard 2-gear diffs. The diff outdrives turn tough steel outdrives and axles, and 14mm hex adapters spin the cool styled wheels wrapped with all-terrain tractor-tread rubber tyres. A single drilled steel disc brake is used for extreme stopping power. Brake pads shod with material used in full-size trucks clamp down when the brakes are applied, bringing this beast to a quick yet controllable stop! All the brake linkage is fully adjustable, but you can leave it as set from the factory or it can be adjusted for prime operation on any surface. For extra efficiency, all the components of the drive-train, from the spur gear to the wheel axles, spin on rubber-sealed ball bearings. With these bearings you get long run times and long engine life while the rubber seals keep out dust and grime! The Bullet MT 3.0 uses a tough suspension design derived from larger racing trucks, but with a few extra bits for increased durability! Long suspension arms are damped by 2 oil-filled shock absorbers each, and tough front and rear bumpers combined with skid plates protect both ends of the truck in just about every collision. Extra-long suspension arms provide stability, and thick suspension pins give you extra insurance against crash damage. Both shocks on each arm are 'captured', meaning the mounting screw attaches on both sides of the shock end for extra durability in any type of conditions. The suspension arms feature a solid construction for extra-tough construction and extreme durability. Multiple shock mounting locations let you fine-tune the handling for whatever you plan to be doing. For advanced tuning, turnbuckle links let you make quick adjustments, and even the steering links use turnbuckles so you can change the front toe setting if you wanted. Go ahead and try it - even though it's perfectly set at the factory for neutral handling, we don't mind if you try something new! The shock absorbers are factory-fitted just like everything else on the Bullet MT 3.0, and are precisely filled with oil for exceptional handling in turns and cushioning when landing big jumps. With big coil-over springs they are the perfect match to the long suspension arms! Optional mounting points are provided on the suspension arms for lowering the stance of the truck slightly (great for running on-road) and stiffening up the suspension at the same time, without using option parts. HPI makes it as easy as possible to get into RC racing action. 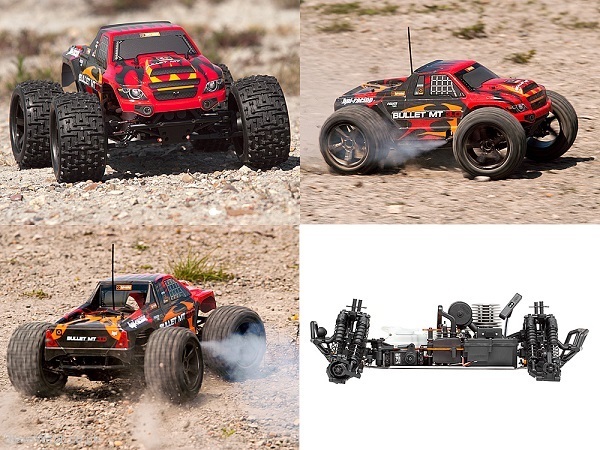 The RTR Bullet MT 3.0 is completely pre-built and ready to go right out of the box! Everything is assembled and tuned for you by professionals - diffs, shocks, suspension and more are perfect before you even open the package. You don't have to do a thing to get going fast! Painted and detailed body shell ready to strut its stuff!